Yet another Christmas present I have yet to blog about. I made this quilt for my mom, she loves to cuddle on the couch with a quilt and she's crazy about snowmen. When I saw a sample of this quilt hanging in the 4 Seasons Quilt Shop I knew I had to make it. Luckily I was able to get the last spot on the waiting list for the "quilt kit". All the flannel fabric I needed (except backing) was included in the kit along with the original pattern. I thought buying the kit might make the quilt assembly/design a little easier and faster, but I was wrong. There were very limited directions concerning how to coordinate colors with the scrap yardage included so I had to wing it. 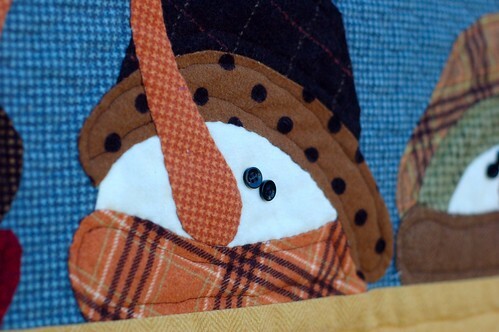 In addition, all of the snowmen faces and accessories had to be appliqued onto the quilt top. I decided to ignore the directions for freezer paper applique and just wing it - needle turning all of the pieces by hand. I used a lightweight bamboo/organic cotton batting, but with all of the flannel fabric the quilt surprisingly heavy. For machine quilting, I stippled and free motion quilted similar to the shop sampler. All in all I love the finished quilt (and Mom did too!). I added black buttons for the eyes and backed the quilt in the light brown polka dot you see in hat brim. It's about 48x60" - the perfect size for a lap quilt. That quilt is cute, cute, cute and you did a fantastic job on it...next try your hand at paper piecing, since you mastered applique. Absolutely ADORABLE! 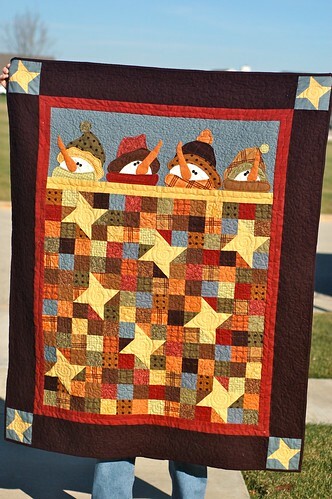 Cutest quilt I've ever seen!